12 Years a Slave, the third film from director Steve McQueen, is unquestionably the Oscar frontrunner this year; harrowing, intensely powerful and at times extremely difficult to watch (in a good way). Based on the true story of Solomon Northup, the eponymous Solomon (Chiwetel Ejiofor) is a musician born free in 1840s New York. He is subsequently deceived, kidnapped and trafficked to the South, where he is sold to a series of plantation owners. What follows is an unflinchingly brutal and horrifying look at the realities of slavery through the eyes of someone who experienced it first hand. Solomon is savagely beaten by slave “breakers” before being sold to his first master, the relatively benign Ford (Benedict Cumberbatch). However, when one of his overseers Tibeats (Paul Dano – as stunningly slimy as ever) takes a disliking to Solomon matters take a turn for the even worse. Solomon subsequently ends up working on a plantation belonging to the brutal Edwin Epps (Michael Fassbender), who quotes the Bible massively out of context to justify the hideous lashings he administers on the slaves who pick the least cotton. Lashings are the order of the day here – many of them, at great length. McQueen is determined to spare us nothing and directs with an extraordinary physicality, making the audience confront the appalling reality of such punishments. In another sequence, where Solomon is almost lynched, McQueen forces the viewer to watch the whole thing in long shot whilst other plantation workers go about their work. Elsewhere there are humiliating slave auctions, rapes, betrayal, murder, more lynching… It is unrelentingly fierce stuff, and rightly so. It would almost certainly be too much to bear for the viewer if it were not for the hope the title itself brings: 12 Years a Slave – a hope that one day, after several years, Solomon will get back to his wife and children. But whilst the audience has that hope, the slaves had next to none, which is of course the entire point. With a story like this, there is a real danger for it to descend into feel-good, triumph over adversity mawkishness. But there is nothing remotely sentimental or dishonest about the film. Solomon is initially outraged because he has been born a free man and can prove it. Yet that in itself is wrong-headed. Why was it any less acceptable for him to be sold into slavery than anyone else in the Deep South? Over the course of the film, Solomon comes to realise this, and by the time he meets abolitionist Bass (Brad Pitt), it is clear that he is a broken man – a man whose hope has all but been snuffed out, mirrored in an extraordinary shot where the burning embers of a letter for help disappear into darkness. 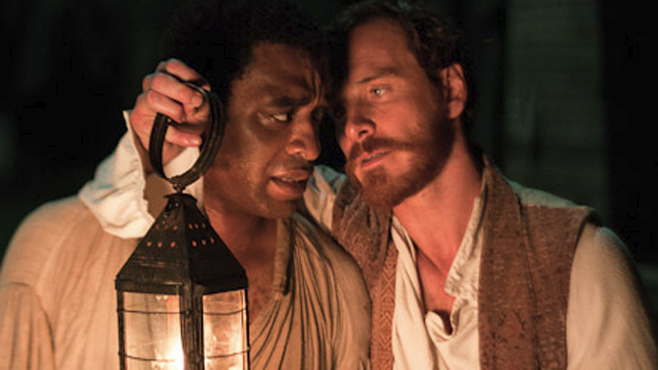 There are some great performances, particularly from Chiwetel Ejiofor who I suspect will win an Oscar. It is his quieter moments in close-up, where the devastating realities of his situation are brought home to him that really give the film its power. Elsewhere Michael Fassbender is spellbinding, bringing to mind comparisons with Ralph Fiennes performance as Amon Goeth in Schindler’s List. His character shares a certain DNA with Goeth in that they were both obsessed with women that society told them they couldn’t have – because they were either Black or Jewish respectively. At war with occasional flashes of humanity is a raging lust that consumes them, eventually causing them to lash out in terrifying ways. The object of Epp’s lust is Patsey, brilliantly played by Lupita Nyong’o in what looks like a shoo-in for Best Supporting Actress. Her eye-wateringly committed performance here is nothing short of extraordinary. I mentioned Schindler’s List earlier. As with that film, by the time the credits rolled I felt exhausted and utterly emotionally drained. 12 Years a Slave is a gruelling, traumatic experience that sugar-coats nothing, but it is also a great piece of cinematic storytelling and comes highly, highly recommended.